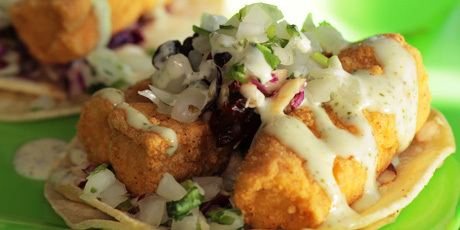 Recipe courtesy of Yayo's OMG.Straight from Nashville's Yayo's OMG truck, enjoy some original Mexican gourmet. 1. Cut the Mahi Mahi into even strips, marinate for 5-7 minutes in beer. 2. In another container, mix flour, cayenne pepper, paprika, and salt. Coat the Mahi Mahi strips into flour mixture, one by one. Lightly fry the strips in oil on medium heat for 90 seconds - 2 minutes, until they are golden brown. 3. Cut red and white cabbage into tiny pieces, and mix with shredded carrots. Add orange juice. Salt and pepper to taste. 4. Blend together sour cream, garlic cloves, lemon juice, and cilantro. Salt and pepper to taste. 5. Heat tortillas on skillet with a little bit of oil. Remove from heat. 6. Use 2 tortillas per taco. Add coleslaw, top with Mahi Mahi strips, add some more coleslaw on top, and finish off with cilantro sauce.